When the team was formed in 2005, The goal of TWENTY12 was to crate a pathway for athletes to the 2012 London Olympics. London resulted in two Olympic medals; gold and silver, the only U.S based road program to achieve this. The team replicated its success with a gold, silver and bronze in the Rio 2016 Olympics. Youth cycling is an important component to the program, supporting 12 of the top juniors in the nation ranging in ages 11-18. These young women learn essential skills such as teamwork, sacrifice and commitment, which they can carry over to the workplace if a professional athletic career is not pursued. 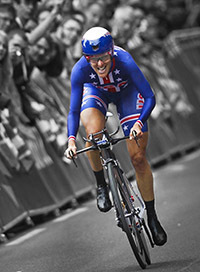 In 2011, TWENTY16 was the first American team to recruit a Para-Cycling athlete to the roster of a professional squad and is the only professional team to have an integrated junior program. After the success of TWENTY16 in Rio, the team is now focused on Tokyo 2020 with TWENTY20. TWENTY20 is a valued recruitment platform for young athletes heading to college. Many universities are now offering partial and full scholarships to capable female cyclists for their varsity programs. TWENTY20 has successfully developed junior athletes and connected them with colleges as they graduate from high school. The priority for our program is always academics, supporting our athletes in obtaining the best education possible for life after cycling. We pride ourselves on working with top partners; innovators and leaders in their fields. Working with four successful Olympians we have learned the importance of details and small percentages which add up to significant gains. We hope you will join us on the road to Tokyo 2020 Olympics. Our unique team model enables experienced riders to perform at their highest potential and offers junior riders a ground breaking mentor program, developing future champions on the bike and leaders in the workplace. Awarded the USA Cycling Centers of Excellence Award for ten consecutive yearsUSA Cycling’s Center of Excellence designation is awarded to select junior and Under-23 development teams which excel in the development of young cyclists. These Centers of Excellence programs consistently demonstrate the ability to develop young riders into nationally competitive athletes. From its grass roots beginnings moving into our fourteenth year of operation, we hope we continue to reach an audience and inspire them to lead a healthy lifestyle and participate in community activities. TWENTY20 Professional Cycling is operated under Tam Cycling Inc. Section 501(c)(3) is the portion of the US Internal Revenue Code that allows for federal tax exemption of nonprofit organizations, specifically those that are considered public charities, private foundations or private operating foundations. It is regulated and administered by the US Department of Treasury through the Internal Revenue Service. One of the most distinct provisions unique to Section 501(c)(3) organizations as compared with other tax exempt entities is the tax deductibility of donations. 26 U.S.C. § 170, provides a deduction, for federal income tax purposes, for some donors who make charitable contributions to most types of 501(c)(3) organizations.